It's not so often that you get an issue that highlights the genius of two contemporary legends such as the one under review. Shura Cherkassky is considered one of the piano titans of the 20th century, ranking with such greats as Vladimir Horowitz, Alfred Cortot, Emil Gilels and many others. Georg Solti's conducting career, if slightly enigmatic, was always thrilling and studio-wise, profusely rewarding. The first complete studio recording of Wagner's "Ring" made between 1958 and 1965 is still considered to be one of Solti's greatest achievements and one can also say that Cherkassky and Solti had rather similar temperaments. Cherkassky's penchant for surprise moulded him into an unconstrained and at times, happy artist, if somewhat orientated towards punctuality and efficiency. Although admitting that he was not that good at improvising, Solti could relax during a concert allowing the orchestra to express itself to the maximum. In Tchaikovsky's Concerto, the outgoing features of both artists serve the music well. The interpretation taped at London's Festival Hall on 30th January 1968 is a fine example of two great musicians bending cordially to each other's will with extraordinary results. Never have I heard such a passionate and yet unrestrained performance as this, with both soloist and conductor going all out to let Tchaikovsky's score enthral and inspire without gripping the audience more than it should. 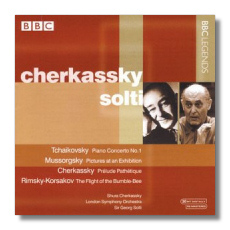 Mussorgsky's "Pictures", Cherkassky's own "Prelude Pathétique" and Rimsky's "Flight of the Bumble Bee" were recorded 14 years later during a concert in Wigmore Hall on 20th February 1982. The latter items are short, evocative works which served the soloist well, especially as encores, but the Mussorgsky masterpiece is given a glowing, opulent and yet broody interpretation. Cherkassky not only gets to the very heart and soul of the music but also etches out a sonorous orchestral sound that leaves the listener entranced and attentive from first note to last. Both recordings, although taken from live events are a fine example of sound and balance thanks to EMI's engineers who I am sure, never left anything to chance. An excellent disc for those who would like to hear two of the 20th century's greatest music makers working hand in hand.